Also known as Banyan Fig. 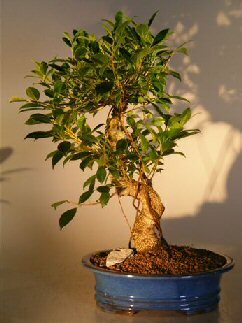 The Golden Coin Ficus has small, dark green, oval leaves which are similar to the Ficus Microcarpa. It has grey to reddish bark that is dotted with small, horizontal flecks, similar to tiger-like markings. Has a heavy trunk and is trained in the traditional bonsai style with a curved trunk. Among the most tolerant, versatile and trouble-free bonsai trees for indoor use.